Here's the first in a long and in depth look at sketches that date back 20 years or more. It gives an insight into the development of our creativity. The only known surviving drawing of "Spot The Hitman". 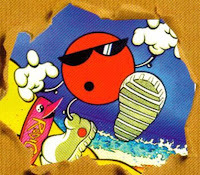 ﻿﻿Paul: Spot The Hitman was an idea fresh off the coattails of 7up's Spot campaign where they had a red dot with shades, and the popularity of it exploded into beach towels, video games, and really anything else you could brand and sell to kids. As Ian will elaborate on below, we owned a game based on the game Othello for Nintendo. It was not bad at all, but it infringed on precious game time with Ian and I by allowing someone other than ourselves play video games. Spot the Hitman's intention was to grab onto the popularity of the "mature" comic book movement of the mid 90's, by having a consistently brooding, dark past having, gun toting, anti-hero who's intolerance to the world around him cause sudden and violent outbursts all around him. Spot was my main character in all the comic books I used to draw in my room satisfying my lust for over the top violence and holding my attention for more than a day or two. Most of Spot's adventures started him out in an a setting on what the world though NYC looked like in 1993, and him confronting a problem with bullets. He sometimes had cybernetic vision tracking, and Gambit-like energy charging abilities for his Ace card that he kept in his hat like a Noire based douche bag detective. He was undoubtedly a poor hitman as he was never hired by anyone, and wasn't discreet about any of his homicides. His run just like the Spot campaign was massive but did not last long, moving on to Paul vs. Ian based comics in the future. Ian: Our parents had an obsession with "puzzle" games as we came up, stocking our Nintendo cartridge carrying cases with any title purporting to challenge the intellect. Our sister inherited this desire to while away hours playing a video game version of something that gathered dust in the adjacent closet. While The Adventures of Lolo never gained ownership status, Tetris crossed our threshold to stay, as did at least two Mario branded rip-offs. Another game to sneak in under that guise was Spot, an animated simplification of Othello, itself a board game based on Elizabethan racial discord, apparently. Spot showed up in commercials for some Uncola that I can't remember the name of. In reaction to the cuteness and impure infringement on video game culture (or perhaps just infringement on our video game playing time), we devoted chunks of our weekends to placing this character, complete with witty one liners and BA overtones, into violent storylines wherein the goal was to give this character the quickest B Line to shooting someone in the forehead and to give him--and the generation he represented--a voice. I believe he was affiliated with an agency and sent on assignments, but it's very likely (as future evidence will evince) that it took very little to provoke Spot The Hitman. No further illustrations of the man in action exist, but I remember several frames of Spot sneaking around a random brick building, throwing that Ace card and stealthlessly executing muhfurrs left and right.